For Sachin Bansal and Binny Bansal, founders of the country's largest e-commerce firm Flipkart, investing in startups is a way of giving back to the ecosystem. The two started Flipkart in 2007 as an online book store from their two bedroom apartment, turning into what is today the biggest and most-funded e-tailer in the country. "Investing in startups is the best charity I can do," Binny Bansal said in an interview to The Times of India on Monday. Binny believes startups are going to be drivers of growth and job creation in the country and hence he invests about 30% of his wealth â€“ this refers to wealth not in the form of Flipkart shares â€“ into emerging companies. For Sachin, backing startups is a way for him to be updated about the latest developments in the startup ecosystem and also helping firms with his experience and knowledge. According to Binny, the current ecosystem is rather focused on how much money a startup will make. There are ventures with products whose profit generating capabilities are a few years away, but the current system of investors do not look at such players, said Binny. "For me, the questions are - will it be game changing, can it have an impact in the economy and society and eventually create a big market, who are the entrepreneurs, why are they doing this," Binny explained. The duo rely on the expertise of Sailesh Tulshan, the founder of Tsai Shen Capital, an investment advisory firm for individuals and large family offices, when choosing their investments. Tulshan works with them full time to help them decide which startups to invest in. Besides this, Sachin said that several startup founders reach out to him directly. Sachin says the maximum he has invested in a startup so far is $500,000. He sees education and healthcare as the next big sectors for investments. For Binny, Internet of things (IoT), automobiles, education are sectors to keep an eye on. He has so far made investments between $100,000 and $500,000. "I exited from three companies when they pivoted and we felt there was a conflict with their new direction. That included Roposo, which pivoted from gifting to fashion, and Zopper, which moved from reviews to e-commerce," he told TOI. 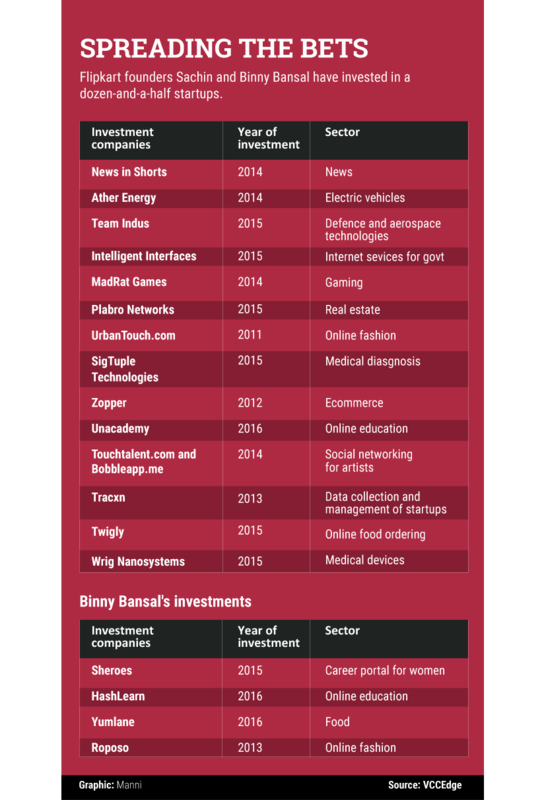 The Bansals are not the only ones investing in startups. Paytm's founder Vijay Shekhar Sharma, Zomato's founder Deepinder Goyal and Snapdeal's co-founder Kunal Bahl are some of the other entrepreneurs backing fledgling firms.